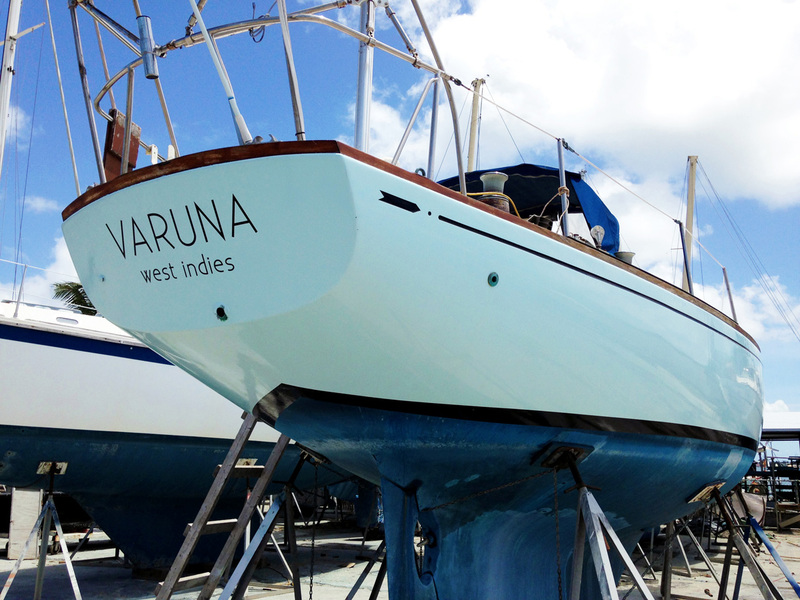 We are back from our season working and have been very busy getting the boat ready to splash. 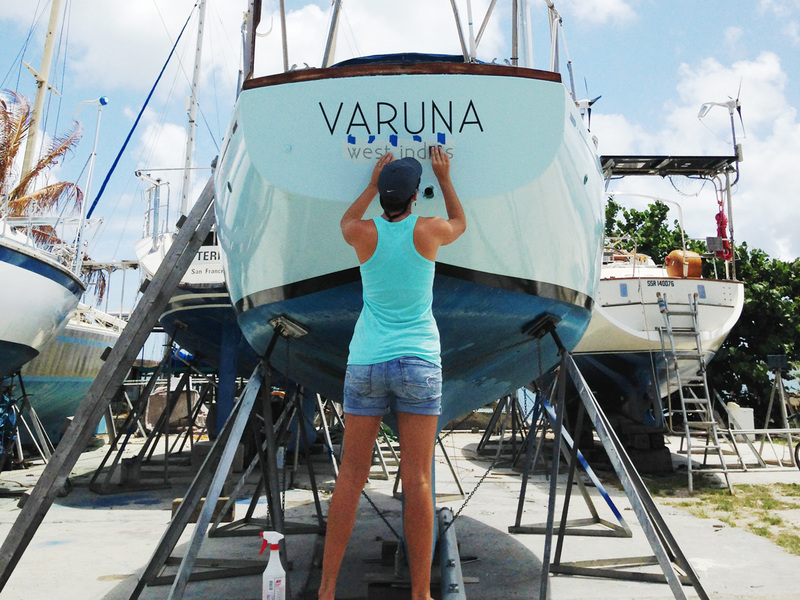 Varuna is getting super fancy - she got her name on today! We searched online for a font we liked and agreed one called Existence. I emailed an Adobe Illustrator file of the name and home port to Imagen Graphics here in St. Maarten and got it back the next day for $60. We taped the name on with the back still attached after measuring and centering the whole thing. 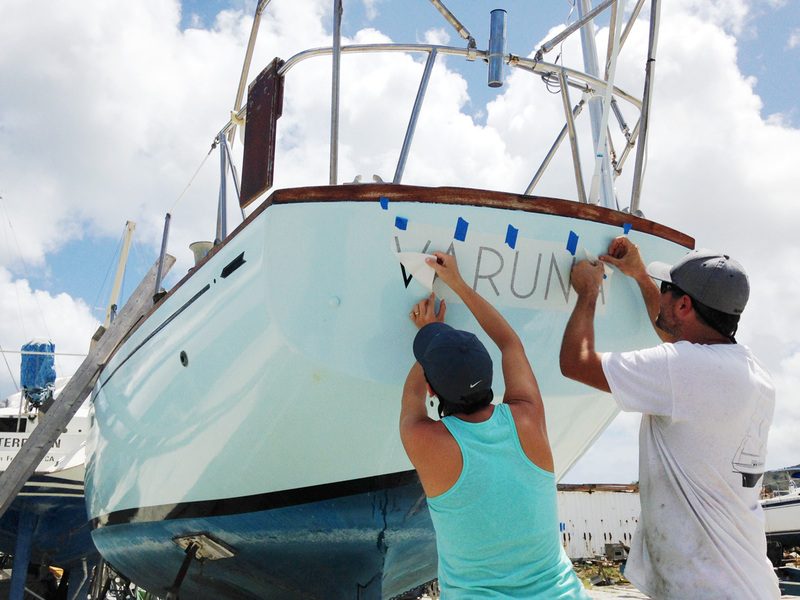 We got a handy tip from a friend that told us to spray the boat with soapy water before pressing the sticker on so that we have a little wiggle room to adjust it here and there if needed. 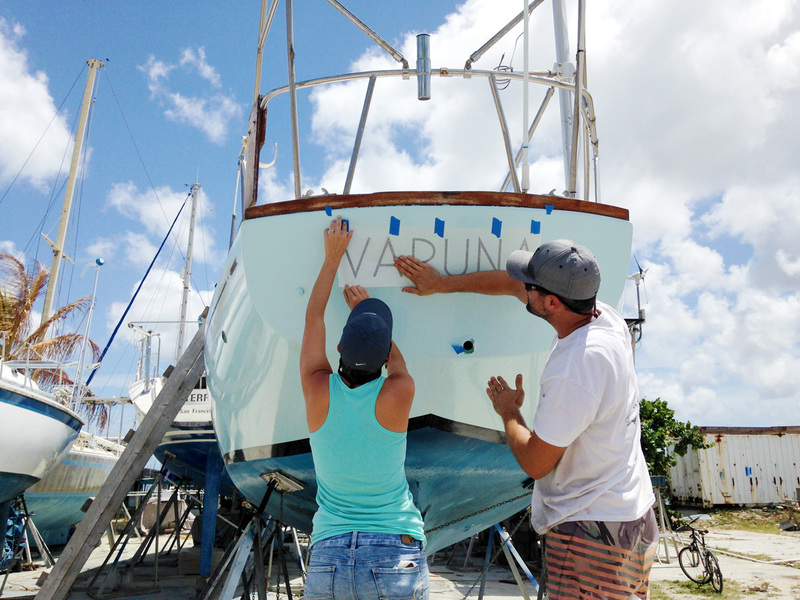 We lifted the name up, sprayed the boat with soapy water, peeled off the back of the sticker, and carefully pressed the name back down. After making sure it was in place, I used a plastic scraper to press the sticker in place and push out any bubbles. Oooh...I love it! How did you get it printed? What is the font? Very cool. Thank you! The font is called Existence Light, it was a free font I found online. I typed in Adobe Illustrator and emailed the file to the printing place. We used a place called Imagen Graphics in St. Maarten. What an amazing job you both have done with this beautiful boat! She looks amazing! I love following your progress, thank you for sharing it! Right on! That looks great on your boat, nice choice. I got super excited when my name was put on too, talk about choices when it comes to font, color, size! No kidding, amazing how many hours you can spend looking at fonts that look extremely similar haha. It's gotta be just right though, huh?! Thanks!